Press Release:- H.E. 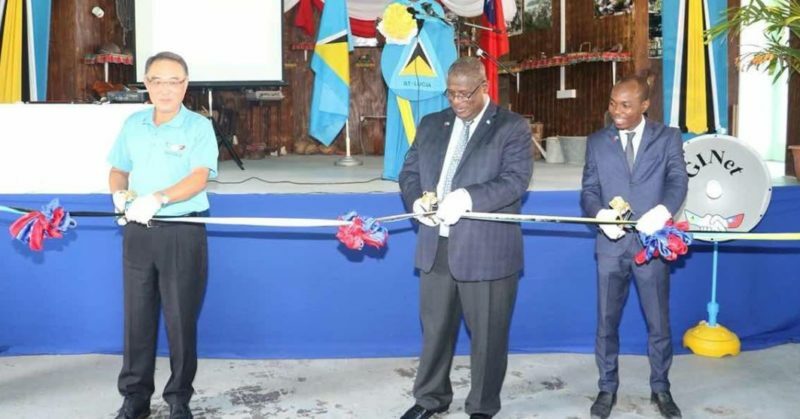 Douglas Shen, Ambassador of the Republic of China (Taiwan) to Saint Lucia, along with Honourable Stephenson King, Minister for Infrastructure, Ports, Energy and Labour, and Honourable Dominic Fedee, Minister with responsibility for Tourism, Information and Broadcasting, officially launched the Government Island-Wide Network Project (GINet) on May 3 at Canaries. Also in attendance at the ceremony were Senator Honourable Hermangild Francis, Minister for Home Affairs, Justice and National Security, Cabinet Secretary Benjamin Emmanuel and distinguished officials from the government. Ambassador Shen said in his remarks that the Government of Taiwan cooperated with Saint Lucian Government to implement the GINet Project with the aim to reduce information gap between rural and urban areas; under this initiative a wireless internet backbone was completed and 63 Wi-Fi hotspots were installed in mostly rural areas, providing local people with free Wi-Fi access. Ambassador Shen also pointed out that in the past few years, Taiwan had completed several ICT projects in Saint Lucia, assisting relevant government departments to upgrade their computer management systems for civil registry, agricultural monitoring, electronic official documents, and crime prevention. He looked forward to more projects to be done in the interest of Saint Lucian people. Minister King and Minister Fedee both extended their gratitude to Taiwan for its long-term friendship, emphasizing the grassroots effects of the bilateral cooperation projects, in particular the Constituency Development Project and the ICT programs. They were confident that local business and tourism industry would receive valuable boost with the full implementation of the GINet Project later this year. The GINet is an Island-wide internet access improvement initiative which seeks to bridge the digital divide and to provide local and wireless network areas in public zones of towns and villages across Saint Lucia. This Project took 4 years, established 63 Wi-Fi hot spots among 5 administrative districts in Saint Lucia. Good Initiative ! If only the Laptop program was still in effect school children would be able to their SBA at their hometown. What is happening to the certificate from the Civil Status programmed by Taiwani IT Personnel where one Certificate would incorporate the birth, baptism and marriage details, one Certificate instead and 3 Certificates. This is LONG LONG OVERDUE. HOn. Minister get the ball rolling. Yow island wide should mean island wide and not just rural areas.stop the sugar coating!